Between Tumblr and Reddit, it’s obvious that people like funny things. One of the best ways to get people to notice your brand is through humor, which can be particularly difficult when you’re a brand with very professional and serious values. Luckily, Taco Bell doesn’t need to act serious. 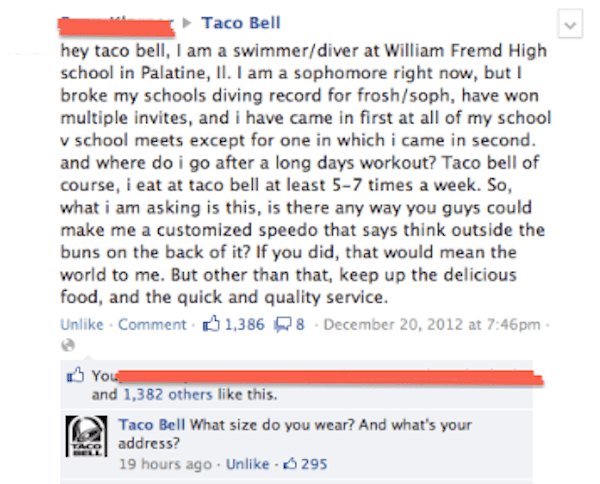 Recently Taco Bell has gotten a lot of free advertising through its Twitter feed and Facebook page being shared all over the internet. But a lot of companies use these two sites, so why is Taco Bell doing so well? Because Taco Bell responds to almost all tweets and facebook comments directed at the company, usually with a witty remark. One of the reasons Twitter is so popular is because it connects everyone with everyone else, allowing a twelve-year old to (potentially) have a conversation with Beyonce or Bill Nye. It’s not often that a famous Twitter user will respond though, so when someone like Taco Bell genuinely takes interest in what you’re saying, and doesn’t just give a robotic response, the internet notices. Drake Bell and Taco Bell make fun of Kanye West and Kim Kardashian’s name for their new baby. *All pictures have links to original source.